It was my pleasure to create the florals for a gorgeous couple Andrew and Claire on their wedding day in March. I knew after working with Claire in the bridal industry, she is the talented owner of Kookachoo Stationery Design, that her wedding was going to be flawless. 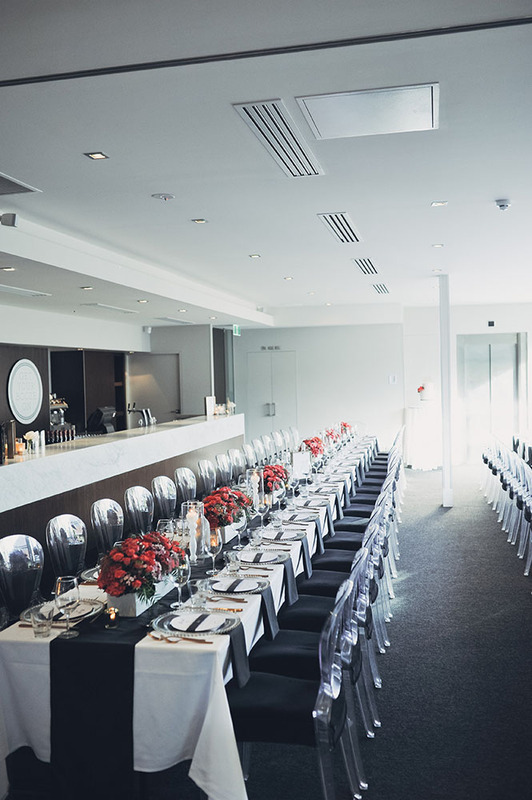 Her impeccable taste was shown throughout from the choosen stunning setting for the ceremony to the ever cool and stylish reception at The Stirling Hotel. 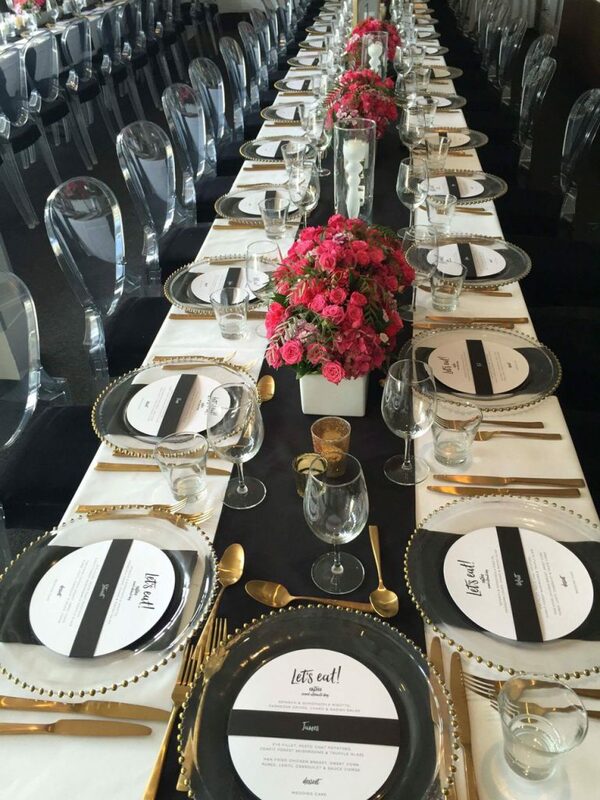 The detailing including gold cutlery and custom black and white stationery gave a modern elegant vibe. 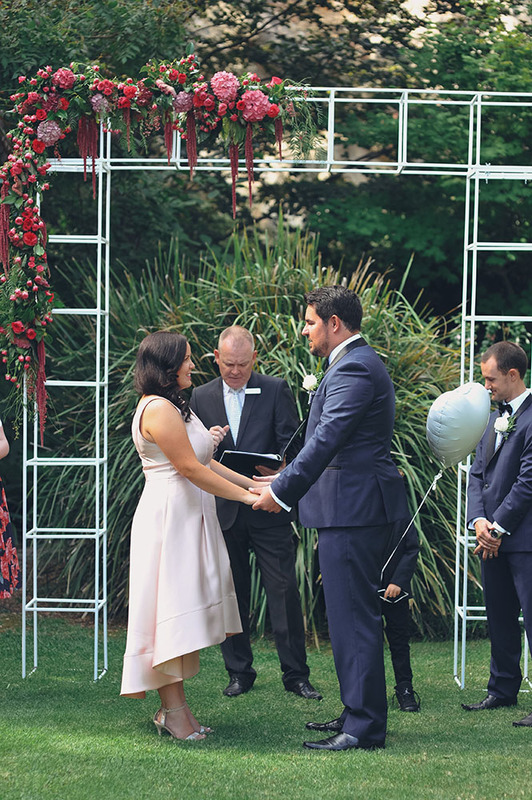 Thank you for these amazing images from Evan Bailey Photography that captured the day perfectly. INDUSTRIAL Ceremony Floral Arch Corner Spray consisting of hydrangea, roses, celosia, amaranthus and pepper berry. Image by Evan Bailey Photography. Claire’s favourite flower is hydrangea and even though the season was coming to an end, I managed to source her the most amazing quality blooms I have ever seen. They were so perfect that even when I was making her bouquets I kept touching them to check they were real! 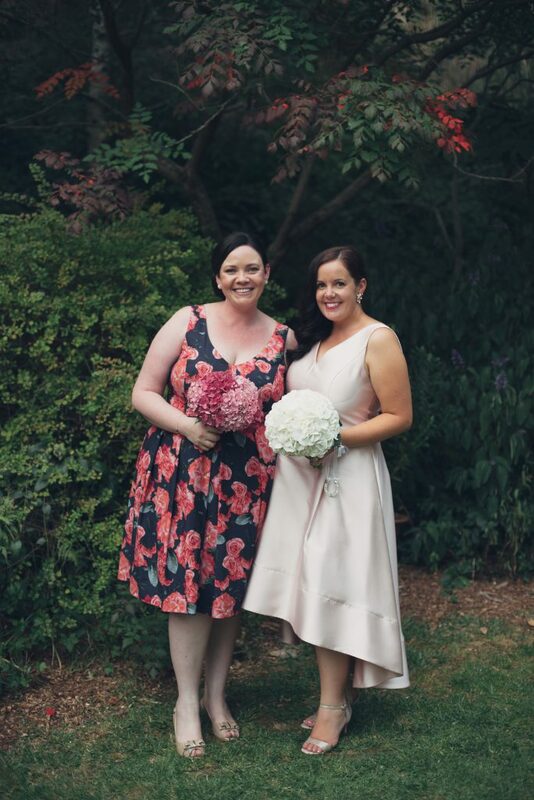 In fitting with her simple and elegant style, Claire has a divine bouquet of all white hydrangea and her bridesmaid had a pink toned bouquet of all hydrangea. 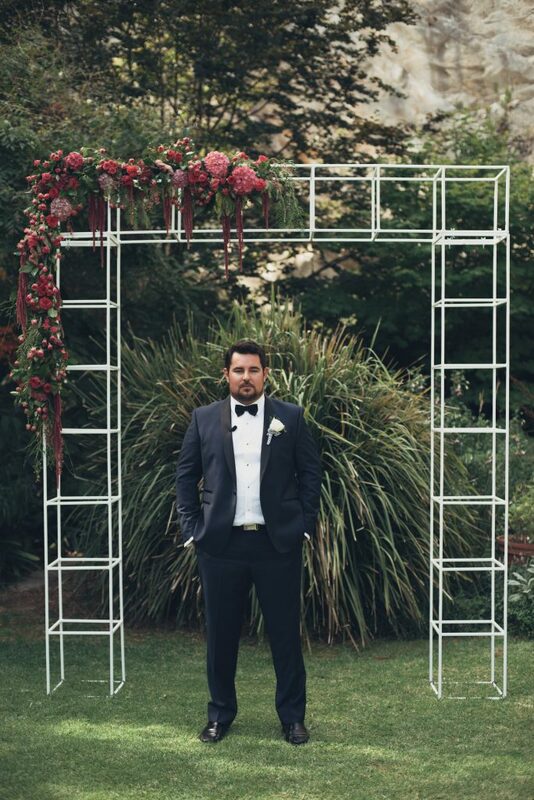 For her amazing modern arbour hired from Kiera Blanden Events + Styling, seasonal bright pink pretties were used to adorn the top corner. I used pink hydrangeas, hot pink roses, hanging amaranthus, celosia and pepper berry. The reception space was upstairs at The Stirling Hotel. This modern room flows out onto a balcony deck and this was the perfect space for dancing the night away. 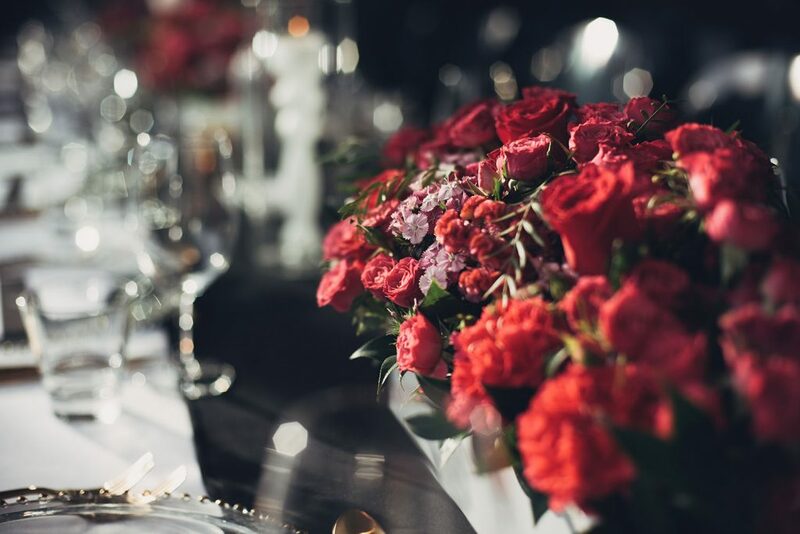 The space was styled with ghost chairs, black and white accents, gold cutlery and the flowers popped in hot pink tones. INDUSTRIAL Ceramic Pot Arrangement consisting of roses, carnations, celosia, sweet william, hydrangea and pepper berry. Image by Evan Bailey Photography. The detailing on the tables was gorgeous and I just love the menus created by the bride herself. They were circular to match the charger plates and the words ‘Let’s Eat’ set the scene for guests. I created long rectangular hedge arrangements for Claire that were spaced evenly along the tables. Seasonal hot pink blooms included hydrangea, roses, sweet william, celosia and pepper berry. 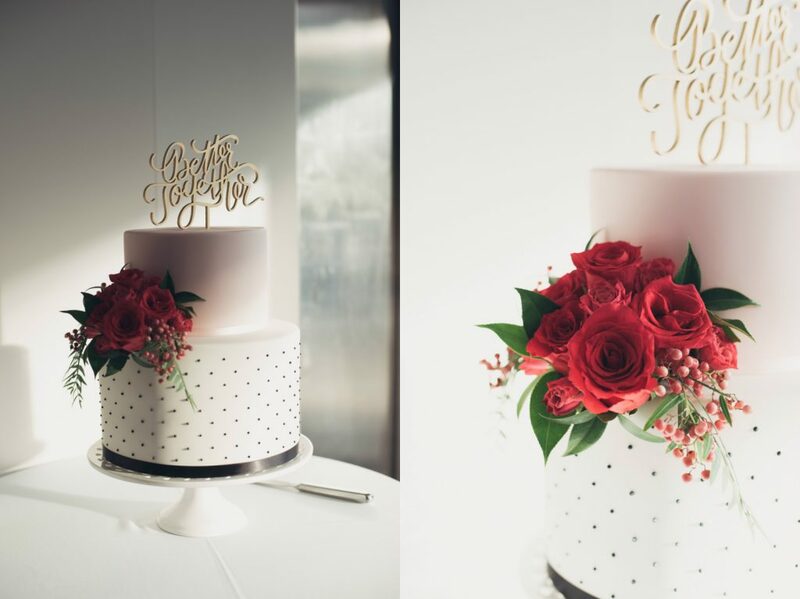 The gorgeous cake by Takes the Cake was created to match the black and white styling with again a pop of hot pink colour added with the flowers. I love the gold sign that adorns the top of the cake with the message ‘Better Together’.